Ms. Yi Zhao graduated from the Southwest University School of Music with a major in piano performance. She is from a family with many talented muscians. Her mother graduated from the Sichuan Conservatory of Music. Yi Zhao studied piano since childhood under the famous piano professor Guo Furong at the Sichuan Conservatory of Music. She has over ten years of teaching experience, including 2004-2012 when she taught in the International Department of Shanghai Shang De Experimental School (currently named Shang De After School Learning Center) and private teaching. 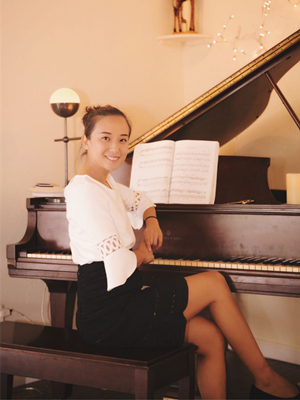 Ms. Zhao is experienced in teaching piano to children and adults. Expertise in cultivating students' perceptions of music, inspiring students to control the musical directions and atmosphere. She has been selected as one of the most outstanding young music teachers in Shanghai. Ms. Chen has been studying Dance since childhood with deep passion and love for dance. She is a registered teacher at the Chinese Dancers Association. Ms. Chen attained professional dancing skills in ballet, classical dance, and Chinese dance for children. She frequently represents Sichuan Province in dance performances around the world including in the US and Japan. In addition to strong stage and dance choreography experience, Ms. Chen is proficient in color, sketch and other traditional art performance skills with many years of training in fine art painting. Her personality is cheerful, warm and generous, which permeates her teaching style. Coupled with her serious, responsible attitude, good communication skills and the ability to foster enthusiasm in the classroom, she is universally well received by parents and students alike. Mrs. Zhang graduated from Heilongjiang University, majoring in Chinese language and literature ,and completed a postgraduate course in journalism at Renmin University of China. She worked as an editor in Harbin Newspaper Group. With profound knowledge of Chinese language and culture and writing skills, she has in-depth research and unique insights into Chinese literature. She takes her work seriously and responsibly, pays attention to raise the child to the Chinese appreciation and the understanding ability. Ms. Min Liu graduated from Huashan School of Architecture in 2001. She later graduated from the Art Department of Shanghai Academy of Fine Arts in 2005 with a major in Environmental Art Design. She has worked for the United States architectural design firm JY, and Shanghai (Taiwan) Ya door architectural design firm. She has extraordinary management abilities and communication skills. Ms. Liu specialized in Sketches, and oil painting, and is familiar with color, sketch and other traditional painting skills. She has a profound artistic foundation, also has long term teaching experience. She is good at teaching children the fine art painting (oil painting, crayon painting, oil color, watercolor, powder, composite material). Ms. Liu is particularly good at teaching painting techniques and can elicit enthusiasm from students with her cheerful and lively personality. Ms. Fang graduated from New York University with PhD in mathematics. She had math olympiad trainings since childhood. She has received many national awards in middle school, and was recommended for college admission. She is experienced in math tutoring, and has many years experience teaching math classes in college. She loves math education, wishing to change the tediousness of math and have students love math. She also hopes to teach critical thinkings while teaching mathematical formulas and principles. Ms. Fang is also specialized in computer algorithms and programming. She has many years experience in software development and algorithms. Ms. Jing graduated from Xi’an International Studies University. Majoring in Modern Dance in Austin Community College. She worked as a Jazz dance teacher in China for three years. Passionate about Jazz, Modern Jazz and hip-hop dance. She and her team had participated and won the runners-up in a dancing competition names “All Star Dancing”in 2015. She is volunteering for our dancing class to share her dancing abilities. Has been studying Kung Fu since childhood. Her long time practice made her a solid skill as special at Yang Tai Chi. She is national level two athlete, level one boxer, level three referees. Chunyu has had many experiences in the domestic martial arts competitions and won the prizes. She won the Baoding City "wuwu cup" martial arts exhibition first prize in 1994, won the Baoding Wushu competition women's youth group first prize on traditional four at the same year. In 1997, she won Baoding traditional martial arts championship first prize and many other awards. Chunyu has a very rich teaching experience. She has been coaching in the matial arts school in China. In the United States, she has served as a Chinese school children's martial arts teacher, taught Changquan, children's martial arts, and taught adult Yang Tai Chi.